Mumbai: Rajeev Kapoor was interviewed by Fiat Group Automobiles S.p.A. chief executive officer (CEO) Sergio Marchionne in Turin, the auto maker’s Italian headquarters, in 2007 before being hired to head its Indian business. “We need to re-establish Fiat in India," Kapoor recalls Marchionne telling him. Kapoor, former general manager and plant head at Hero Honda Motors Ltd, India’s largest motorbike maker, was given a free hand by Marchionne in revving up the Fiat brand in India. “He expected in return a high level of performance in terms of quality and speed," says Kapoor, CEO of Fiat India Automobiles Ltd, a 50:50 joint venture between Fiat and Tata Motors Ltd. Implementing the brief wasn’t going to be easy. Marchionne was effectively handing Kapoor in India the equivalent of the job he himself had performed at a global level by restoring Fiat’s ailing automobile division back to the black in 2006, two years after taking over as CEO of a company that had piled up almost $12 billion (Rs55,560 crore) of losses over a four-year period. Fiat India hasn’t quite turned around as spectacularly and continues to lag behind rivals, but a quintupling of sales in the seven months to October on the back of two new launches—the Linea sedan and the Grande Punto hatchback—suggests that the firm is doing something right as it aims for a cash profit by 2011. Fiat’s resurrection reflects the change the parent firm has under gone under Marchionne, who has infused a new dynamism in the firm. Fiat’s market capitalization, which has soared to €13 billion (Rs90,220 crore) from €5.7 billion in 2004, is a testament to that change. “Between 2004 and today, Fiat has been through a major transformation internally," says Silverio Bonfiglioli, chief operating officer at Fiat Group Automobile. Twice before, Fiat faltered in the Indian market, where it failed to capitalize on its first-mover advantage. A technical collaboration and then a joint venture with Premier Automobiles Ltd, in the 1990s, went astray. Newer models from the assembly lines of Maruti Suzuki India Ltd, Hyundai Motor India Ltd and Ford India Ltd quickly overtook Fiat products such as the Palio hatchback and the Siena sedan. It was an example of European manufacturers failing to read the Indian consumer’s mindset and taking the market for granted, says a partner at a global consulting firm who declined to be named. The troubles at Fiat’s parent firm didn’t help, clouding the future of the auto maker and its affiliates. That was until Marchionne took over as the fifth CEO of the auto maker in two years, and began the turnaround job. Fiat had no dedicated vendor, and its sales and after-sales service had been a sore point with customers. “Owing to the sheer volumes, it was unable to have dedicated suppliers," says R. Venkatraman, partner at consulting firm AT Kearney. Fiat had almost decided to pull out of India, but for Marchionne and Tata group chairman Ratan Tata coming together in 2006, Kapoor said in a previous interview with Mint. Apart from other synergies, the tie-up with Tata Motors gave Fiat access to an extensive vendor base through its component-manufacturing firm, Tata Automotive Components Ltd (TACO), and other vendors. “We save costs because we buy some components from Tata suppliers and sell some engines to Tata," Bonfiglioli said, pointing to the hatchback Tata Vista and the sedan Tata Manza, both of which are fitted with Fiat engines. Still, fixing the business was a tall order for Kapoor, the fifth and the first Indian chief executive at Fiat India since 2000. Not only had he to build everything ground-up, he also had to bridge the Indo-Italian cultural divide. Kapoor was given the mandate to replace Italian professionals with locals. His own experience on Hero Honda’s shopfloor came in handy and helped him deploy practices such as lean management, a manufacturing process that seeks to create maximum value using the least inputs. Bonfiglioli believes the strategy to recruit local talent has been yielding results. “While we have the knowledge, they could help with the specific understanding of the market. Integrating these two makes it successful and helps to grow in a local market," he said. Kapoor and his team had little time to lose in a rapidly growing car market that had been transformed by an influx of foreign auto makers. Having gone from being written off to a point of acceptance, Fiat is now plugging the gaps in its after-sales service. For Ravi Bhatia, who joined Fiat in June 2008 as vice-president (commercial) and was still settling in his new position, an email one morning from a customer was an eye-opener. “Fiat has to get it, it still doesn’t get it," read the mail. “One doesn’t buy a Fiat for simple functional benefits, there’s something more one buys a Fiat for." Having spent eight years in several roles, spearheading after-sales, marketing, spares and service initiatives at car market leader Maruti Suzuki India, he knew he had to act quickly to fix the sales and after sales service. Fiat now has 127 sales and service outlets. Maruti Suzuki has 600 sales and 2,628 service outlets. Fiat last month launched a plan called Fiat First, offering a 50-month warranty on the Punto and Linea models and a new roadside assistance programme for all the Fiat owners, among other facilities. It is also building capacity to supply regular and emergency spare parts. Bhatia says these initiatives will help the firm address the “core reputation issue". From April through October, sales climbed to 15,114 units, up 447.21% over a low base in the same period last year. From being a car maker that was ignored because of its high prices, obsolete offerings such as the Uno, which was near the end of its lifecycle when it was introduced, and the Sienna, Fiat’s image is now driven by contemporary models such as the Linea and Grande Punto. “The Linea was a big jump for Fiat. I am surprised that they are doing so well given the fact that it’s been a company that has been inert for several years," says Hormazd Sorabjee, editor Autocar India. Fiat has sold at least 10,000 Lineas since January and 6,000 Grande Puntos since it was introduced in June. Fiat India envisages selling 6,000 cars per month and turn in a profit by 2011, Bonfiglioli said. “Whatever we consider important to be a volume player will be done," he said. Work on another compact car meant for emerging markets is underway at headquarters in Turin, Kapoor said. Of course, Fiat still has some distance to cover to catch up with its rivals in a market where the Linea competes with Honda Siel Cars India Ltd’s City model that sells as many as 5,200 units a month; the Grande Punto is pitched against Maruti Suzuki’s Swift, which sells as many as 9,000 units a month. Competition can only intensify in a market where 1.2 million cars were sold in the year ended March, as global carmakers such as Volkswagen AG, Toyota Motor Corp. and Nissan Motor Ltd prepare to launch a slew of new compact car models next year. It’s premature to say Fiat “has arrived" unless it is able to sustain volumes and withstand the onslaught of new models, says Neeraj Bandhu, director of CSM Worldwide, a global market research and sales forecasting firm. When K.G. Mathew, a Bangalore-based information technology professional, wanted to buy a Grande Punto, the dealership failed to offer a car for test drive even after a week. Mathew decided to buy a Swift instead, although there was a three-month waiting period. “Unlike the salesman at the Fiat dealership, who seemed disinterested, the one at the Maruti dealership, was more persuasive and followed up till I booked the car," said Matthew. Mohit Arora, senior director at automobile consultancy JD Power Asia Pacific Inc., said while Fiat has been working hard to better customer experience, it still has to cover significant ground. “While they have climbed up the SSI (sales satisfaction index) rankings from the bottom to the mid-level, they continue to be at the bottom year-on-year in CSI (customer satisfaction index)," he said. The joint venture with Tata Motors was part of Marchionne’s global strategy of collaborating with local partners in emerging markets such as India, China and Russia with the twin objectives of sharing costs and achieving scale and penetration. The partnership with Tata Motors has two facets: a joint manufacturing facility in India that will produce cars for both firms and a distribution agreement under which Fiat will retail its products through Tata Motors’ outlets. “What we got from Tata Motors is not only the network but the network management expertise," said Bhatia, vice-president (commercial) at Fiat India. For Tata Motors, the partnership enabled it to offer dealers a wider range of products. “We have been able to address the B segment (compact cars) with the Palio, Punto and Indica Vista," said Rajeev Dubey, president of the passenger cars business at Tata Motors. However, there are some side effects of the operational synergies. “There is bound to be some cannibalization within the product portfolio as all the models are retailed from the same showroom," said Bandhu of CSM Worldwide. 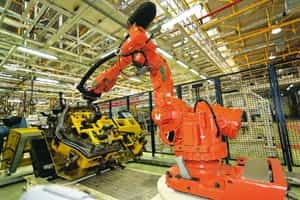 Tata-Fiat’s state-of-the-art factory in Ranjangaon, Maharashtra, which became operational in 2007 and has the capacity to make 35,000 cars a year, can weld 350 Linea and Grande Punto bodies daily. Tata Motors only uses it for the Manza and some older versions of the Indica. Analysts say it will be crucial for the joint venture to adhere to its cash-break-even deadline, for which higher volumes and better capacity utilization levels are pivotal. “It’s critical for Fiat to achieve scale by way of either launching more of newer products from the facility, or using it as a global export hub to address the developed markets," says Mahantesh Sabarad, an analyst at Mumbai-based brokerage Centrum Broking Pvt. Ltd.